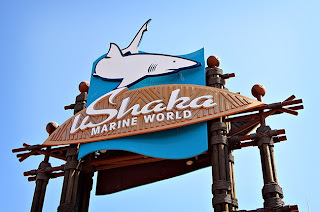 I went to uShaka Marine World, a popular international Marine theme park in Durban, South Africa. I made a day of it and had immense fun going on all of the available rides. 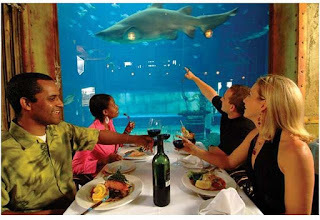 uShaka is beautifully themed with a distinctive African makeover given to the usual Waterworld inspired theme you find in most marine theme parks. 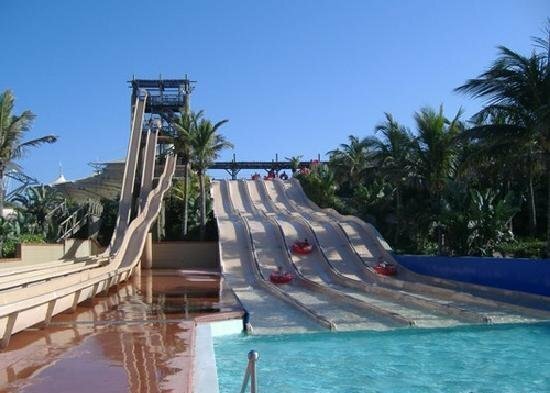 • When you enter the Wet and Wild section of uShaka, where all the slides and rides are, you pay a $25 entry fee per adult. This entitles you to go on any ride/slide as many times as you want until Wet and Wild closes at 6pm. • But after entering Wet and Wild you realise you have your car keys, wallet and mobile phone on you. You cannot submerse these in water or leave them lying on a grass bank to get stolen, so the only option you have is to use one of uShaka's lockers. For this privelege you pay a $10 refundable deposit plus a rental fee of $5. • You need a place on the grass bank to leave your towel, sunscreen and other non-valuables. The sun beating down on you while sitting stationary on the grass necessitates an umbrella. These are available from the umbrella kiosk at a cost of $6. • Chairs are also available to rent, but I didn't bother checking for how much. • When you exit Wet and Wild, you are forced to walk through the uShaka curio shop - there is absolutely no other way for you to exit and all sorts of pretty but expensive curios catch your eye and tempt you to spend. This is really pushing the boundaries of permission marketing. Still, it's a clever thing to do though: What better way to remember the fun time you had at uShaka Marine World than to pick up a souvenir just as you leave? • Oh and parking for your car will cost you $3. To a person with dollars these rates are not so expensive and if you've flown all the way to Durban you aren't exactly going to leave uShaka if you're being ripped off a few dollars here and there. But to a South African using Rands these rates are exorbitant. Many South Africans don't earn $25 for a full day of work, yet here you pay it over just for the right to use their rides. uShaka Marine World represents American capitalism turbocharged. Once you're inside, you have no option but to pay for all sorts of extras that you didn't account for or didn't think you would have to pay for when you were outside. While December tourism will buoy uShaka up, I read that during other times of the year it is something of a white elephant that isn't strongly supported by locals. This is no doubt due to the high tariffs and a culture of fleecing in the type of place that was conceptualised to be an affordable day out for the everyman and his family.